About - Matt Sailor. Writer. 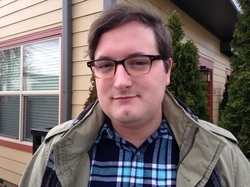 Matt is a writer and editor living in Portland, Oregon. He earned his MFA in fiction from Georgia State University, where he was editor-in-chief of New South for two years. He lived in Atlanta for over 20 years, and was born in Lansing, Michigan. Much of his work is informed by the time he spent in the Midwest. He is the fiction editor at The Mondegreen and a former associate editor at NANO Fiction. By day, he is a creative director at AHA, a marketing and strategic communications agency in Vancouver, Washington. His fiction and essays have appeared in many publications, including PANK, Five Chapters, AGNI, Paper Darts, and Day One. His work was featured in Bring the Noise: The Best Pop Culture Essays from Barrelhouse. His ongoing pop culture memoir series, "Great Moments In Cinematic Drinking" is currently running at Hobart. He was awarded a 2014 National Endowment for the Arts Fellowship in creative writing for his novel, 1985. You can reach Matt at mattsailor AT gmail DOT com, or @MattSailor on Twitter.